Activities form a major part of Microsoft Dynamics CRM. Sometimes it becomes necessary to perform operations on many of these activities at once. 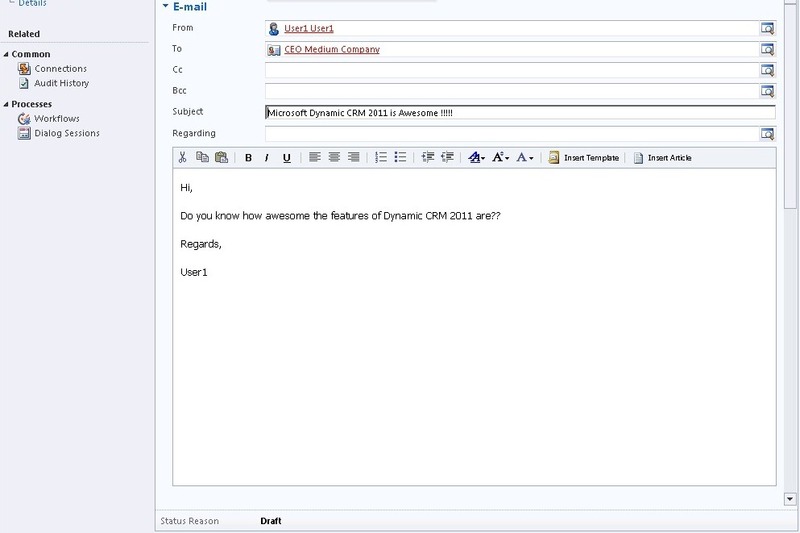 Microsoft Dynamics CRM 2011 provide ways to manage multiple activities at once. With the new grid view of Dynamics CRM 2011 you just have to select the multiple activities you want to manage together using the checkboxes. You do not have to hold down the control key like in CRM 4.0 for multiple selections. The only bulk operations supported by Microsoft Dynamics CRM 4.0 was Assign to operation. 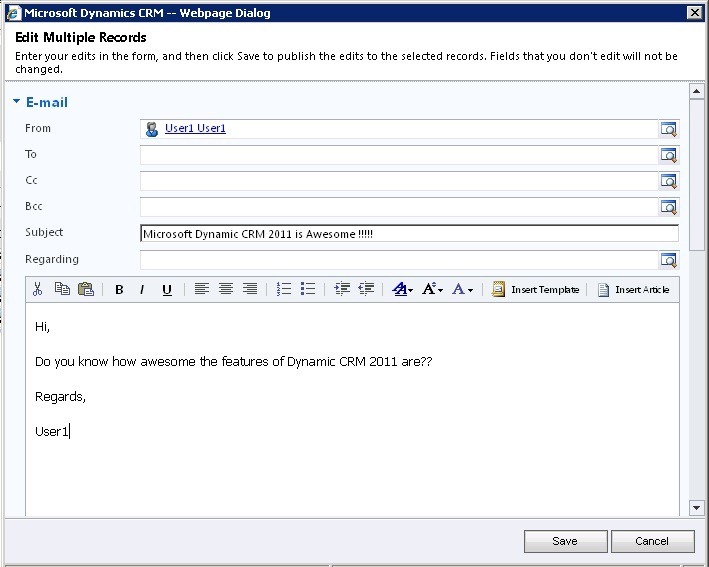 Microsoft Dynamics CRM 4.0 provided Bulk Editing capabilities for various records. Bulk edit was not supported for Activities. 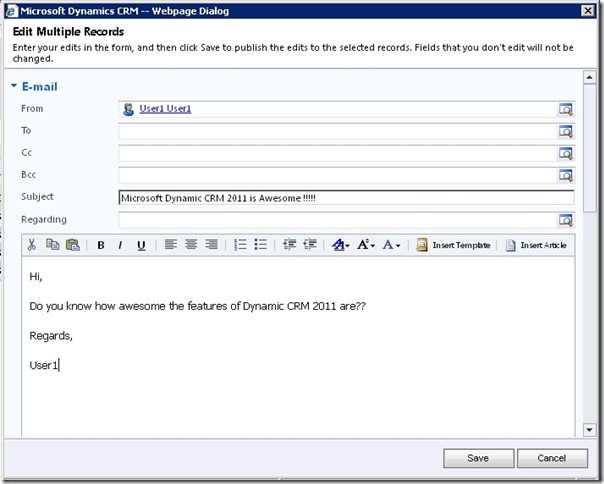 With the new Dynamics CRM 2011 bulk edit support has been provided for most activities. Activities that do not allow bulk editing include Recurring Appointments. You cannot bulk edit components of different activity types. This is because each Activity will have its own unique bulk edit form. Also some fields also might be disabled if incompatible for bulk editing. 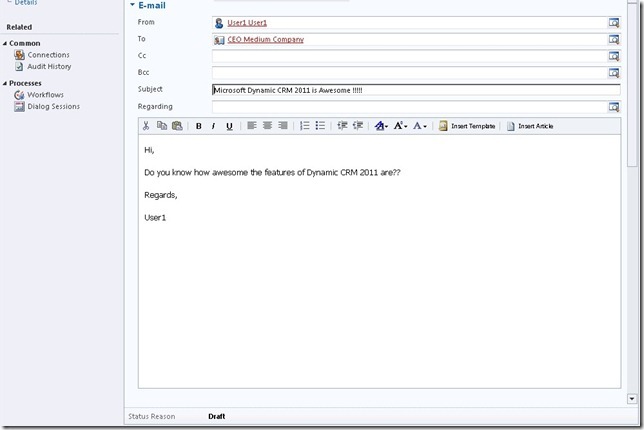 Let us assume that we want to send letters to 3 personalized emails to 3 different Contacts informing them about the new Dynamics CRM 2011. First we create 3 Emails each of them having different recipients. Select the three different emails and click on Edit. An "Edit Multiple Record" form appears. We can now place in the text about how much we like CRM and how awesome it is in the fields we want. All entries that are left blank indicate that you do not want to update the original entry in the Email. So now if you actually check the individual mails, you can find a personalized mail for each user. Note that there is no way to blank off any entry using the bulk edit feature. Operations such as Set Regarding, Add Note and Add to Queue support activities of different types. Lets assume that we want to perform Set Regarding operation on the three emails and maybe a couple of corresponding appointments to a particular campaign. We can use advanced find to actually find the records we want to perform the bulk operation. Select all of them. Then select Set Regarding. A lookup dialog box pops up where we can select the appropriate campaign we want. Note that some of these operations that are not supported for certain activities. So these operations will not act upon these activities in bulk also. For example, Email activity does not support Mark Complete operation.